Liquor Inventory Control Essentials: If you run a bar or restaurant you are in the business of selling beer, liquor and wine for a profit. Given the fact that the typical bar loses 15-20% of all the product they use to inventory shrinkage,it's essential that you take control of your liquid assets with sufficient liquor inventory controls. 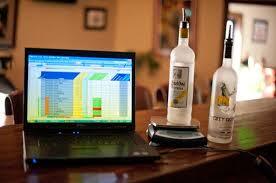 Any effective liquor inventory control system must achive the following 5 goals. Performing liquor inventory at your bar the old fashioned way (using a clipboard to calculate your liquor cost) is a costly mistake to make which costs the average bar around 3% of their total bar sales! If your bar does a million dollars in bar sales each year you're talking about $30,000 of losses per year at cost not to mention the effect of those missing retail dollars! Precisely compare what you sell versus what you actually pour- more essential than any other function. If you can't precisely compare how many servings of every product were sold versus actually poured do you think they will magically be the same or do you think having this information would be useful to achieving that goal? Reduce value of inventory on hand- bars that are efficient in their liquor inventory management keep 3-4 times what they use per week on hand. Say for example you do $20,000 in bar sales per week with a 20% liquor cost, that means you use $4,000 worth of inventory per week. This means you shouldn't have more than $12,000 - $16,000 in inventory on hand. Really efficient bars keep the ratio nearer 2 times! Streamline the process of ordering- Performing physical inventory counts so you can reconcile deliveries and calculate precise useage is critial to effective inventory control. A smart liquor inventory control system will also automate the process of ordering based on pars after each weekly count. Allow data driven decision making- The hospitality industry is rennowned as being extremely competitive with many businesses closing every year. If you want to buck the trend and rise to the top it's critical you have detailed information with which to make informed decisions. Liquor cost simply doesn't cut it! Provide a check and balance- For the same reason you reconcile your cash drawer every night it's important to have a check and balance on your liquid assets by measuring the performance of your staff. To avoid a direct conflict of interest it makes a lot of sense to involve an outside party to perform this function. Their expert, independent advice will challenge you and keep your business evolving.